Unlocking Potential is to announce the launch of its new programme at a special event and workshop on Tuesday 2nd April at The Barn, Trelissick Gardens. The event will introduce the new programme by exclusively revealing the new name and branding on the day. Following an introduction from Unlocking Potential programme director, Allyson Glover, the morning will be headlined by positioning and differentiation strategist, Angelo Spencer-Smith, who will be launching the first of six main areas which will be covered throughout following monthly events. 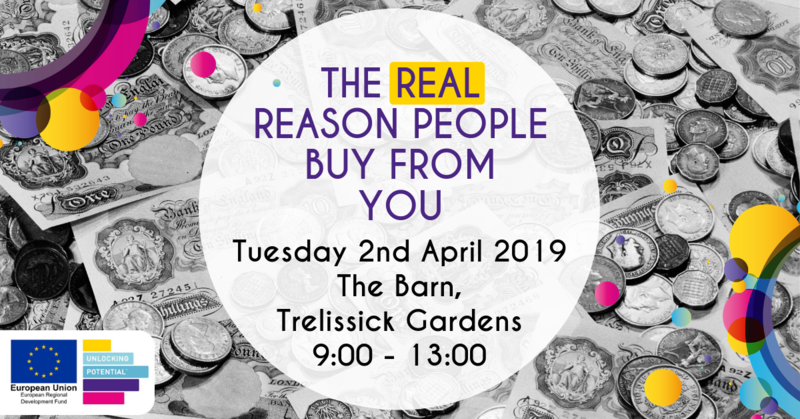 The launch session titled ‘The Real Reason People Buy from You’ will help businesses to be really clear on their proposition and better understand their customers in order to be better equipped to find new audiences more easily. It will touch on brand, customer segmentation, positioning, pricing and marketing planning along with practical digital tools and tips that businesses can use. There will also be the opportunity to hear from and chat to some local business people who have had success in this area and time set aside for table discussion and networking with others in a similar position. You will also have access to our digital marketing experts who will share some of their latest thinking. This event is aimed at businesses with a turnover of 70k+ who are looking to re-focus their marketing activity and win new customers. It will best support those businesses who are finding it hard to attract the right customers and give them the opportunity to review their offer and refine their approach. It will also explore how to build marketing capacity and how through the programme you can access the practical tools and resources to do this.